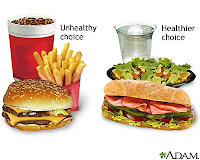 Most people have the misconception that, if you eat out, the food must not be healthy! Obviously it's easy to make the unhealthy choices because they're usually easier to find on the meny, cheaper (most places have many $1 deals) and more appealing to kids. Eating healthier, however, has recently gotten much easier because restaurants are now required to post nutritional information directly on their menus! Now, when you see that number next to the double cheeseburger you wanted (usually between 700-900 calories), you may look for a healthier, less caloric option. Need some tips on finding some of the healthiest burger options out there? Check out this article on the 10 Healthies Fast Food Burgers & Sandwiches out there! Still don't see anything you'd like? Try the following suggestions at each of these fast food restaurants and you won't have to worry so much about your waistline next time you eat out! You have shrimp, chicken, turkey & lots more to choose from! 432 calories & 17 grams of fat. That's under 500 calories for a full, fresh meal!